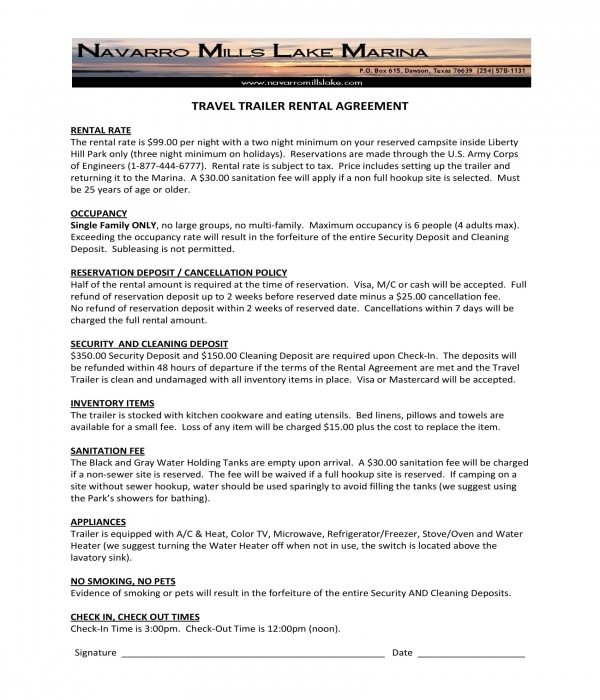 Trailer rental agreement forms are documents which are used by trailer truck owners whose aim is to rent out or lease out their trailer trucks to clients who are in need of transportation services. Just like all other rental agreement forms, this document is composed of information and details about the requirements as well as the obligations of the involved parties regarding the rent transaction. To validate the agreement, both parties must affix their signature along with the notarization seal of an attorney if the rent intention is associated with legal constitutes and regulations. Camping Trailer Rental Agreement Form – Going to a camping trip is an enjoyable and adventurous activity which is often associated with family outings and scholastic extracurricular events. However, a camping trip does not only require the participants to be physically ready and have prepared bags, but also a transportation vehicle which can withstand the rocky roads towards the camp location. This is when a camping trailer truck becomes efficient for the campers since it is often big enough to contain a number of people along with their packed materials. To lease or rent out the trailer, the camper’s representative or driver must fill out a camping trailer rental agreement form. The form contains five main sections. In the first section, the renter will be presented with the instructions and the requirements to be met in order to be eligible to rent the trailer. 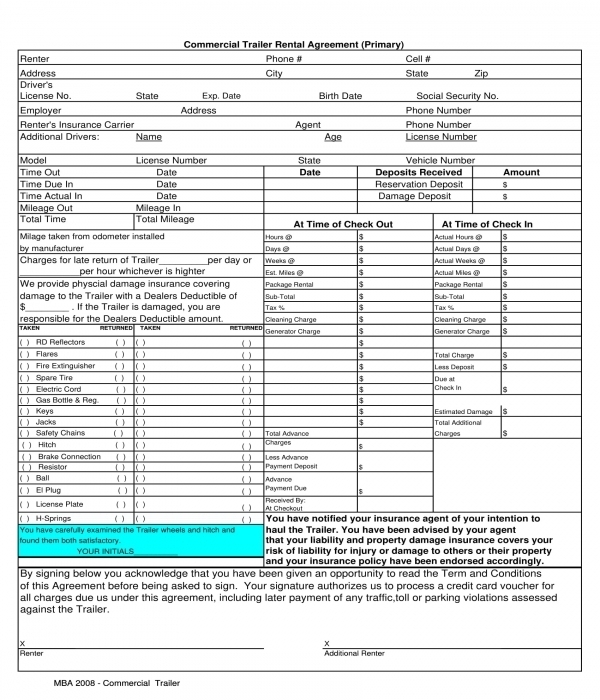 The second section of the form, on the other hand, is intended for gathering the general information of the renter such as his name, contact details, the organization that he is managing or representing from, as well as his contact details and driver’s license number. The rental period, location, security deposit agreement statements, and the total rental amount to be paid by the renter are all defined in the third section of the form. A rental statement is also incorporated as the fourth section of the form which indicates the intent of the user in renting the trailer and in meeting his responsibilities and obligations to achieve a successful rental transaction between him and the trailer owner. Along with the statement are the details of the renter’s credit card or bank account to be used for paying the rental fees with his signature to certify his agreement with the trailer owner. 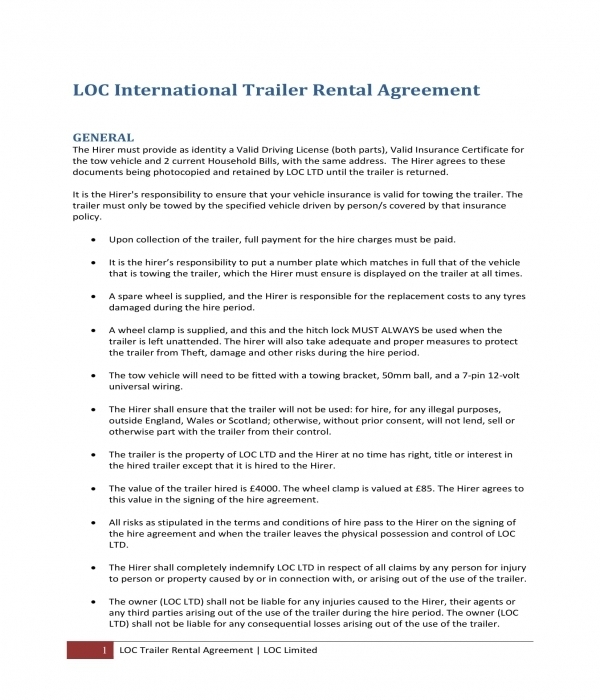 Lastly, the fifth section of the agreement form is where the renter will be able to know about the definitions for the terms and words used in the agreement for defining the rules and regulations as well as knowing his obligations to be executed throughout the period of the trailer rental agreement. 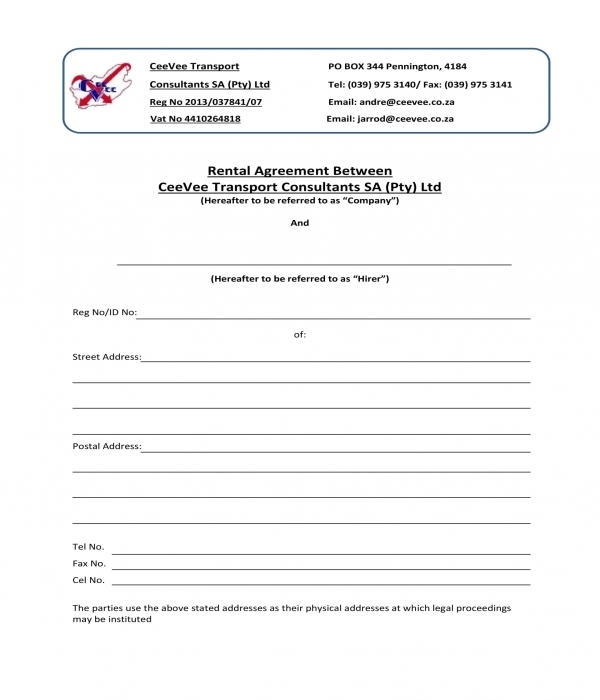 Commercial Trailer Rental Agreement Form – Transporting business goods becomes easier when a trailer truck is in use. 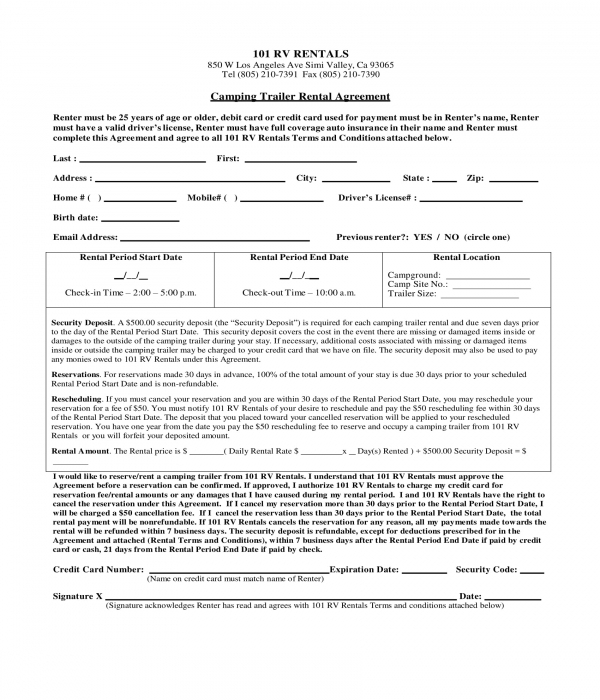 This is why a company or a business enterprise who will be needing the aid of a trailer transportation service must fill out a commercial trailer rental agreement form. The main purpose of having the agreement form is to construct and finalize terms and details of what will be expected by both parties involved in the rent namely the commercial trailer owner and the company business’ representative. In the form, the business representative will be required to disclose his particulars along with the type of insurance that the company has when it comes to transporting their business items and goods. Moreover, the type of trailer which is provided to the renter and its descriptions are also stated in the form including the time out and in of when the truck was used, its mileage total, and the specific charges to be penalized to the renter if he goes beyond the agreed limitations of the trailer owner. Additionally, the form also has a list of materials and items which are already provided inside the trailer for emergency situations such as fire extinguishers, reflectors, flares, and spare tires. These items should be returned to the trailer owner upon the timeout or the return of the trailer truck. To ensure that the truck has all the provided items after the rent, the trailer owner will have to conduct an assessment and inspection to his truck and determine what items are missing or have been used to be replaced by the renter. 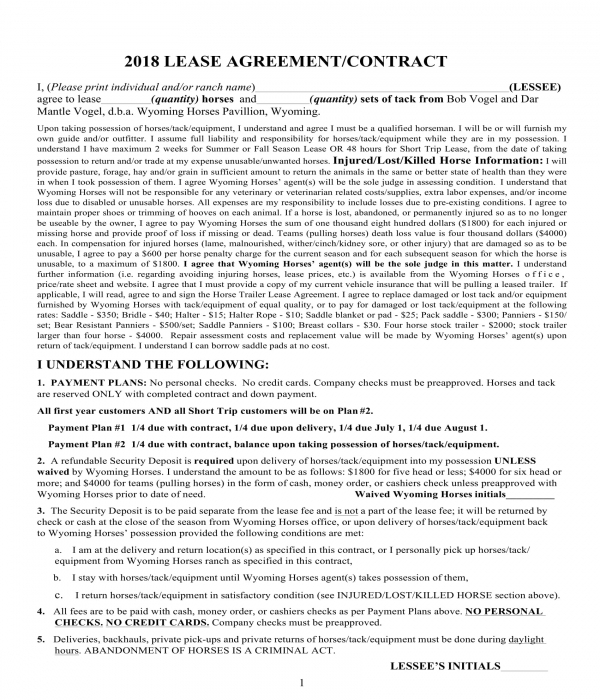 Horse Trailer Lease Rental Agreement Form – For horse lease business owners, it is important that the lessee will not be dealing with any sort of difficulty when transporting the horse to a location during the period of the lease. This is why the owner must prepare a horse trailer lease rental agreement form. The agreement form will not only inform the lessee about the terms and conditions of the owner but will also inform him about the transportation services that the owner can provide such as a horse trailer. Payment plans, the condition of the horse, and the transportation information of when and where the horse will be delivered are all stated in the form. 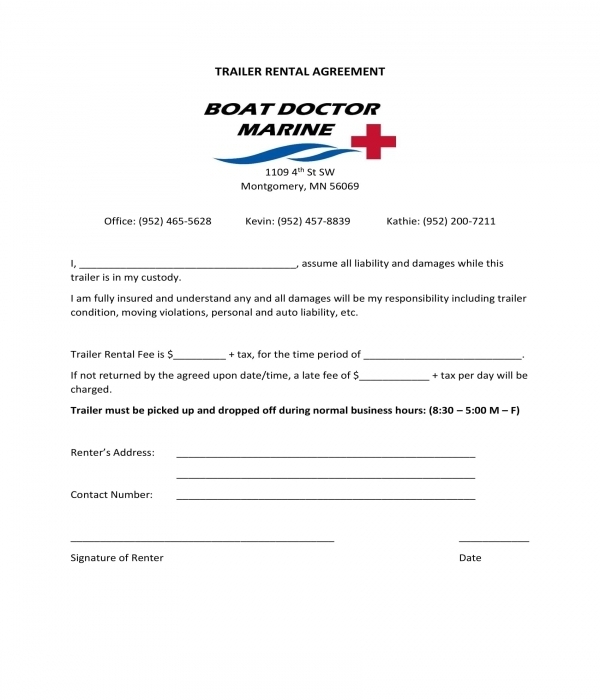 Pontoon Trailer Rental Registration Agreement Form – A pontoon trailer is a type of boat trailer which is used for easily transporting pontoon boats on land by lifting the boat from the water. 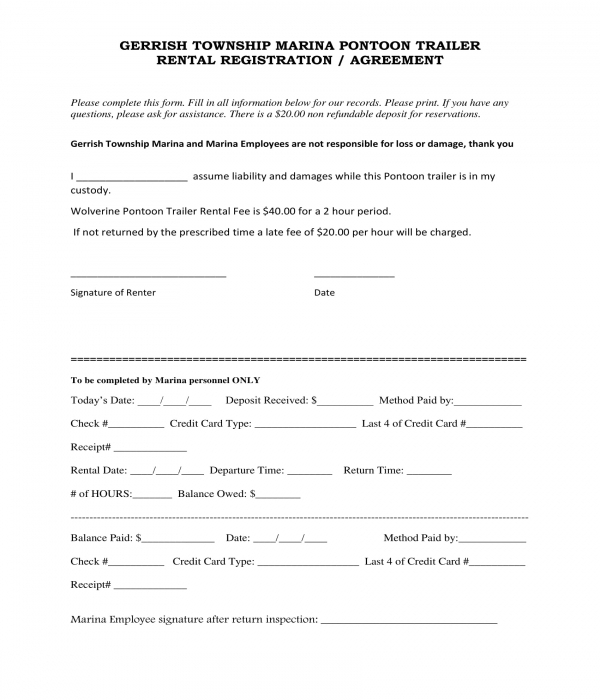 Pontoon trailer rental registration agreement forms are often created by trailer owners who focus on marine transportation services. In this variety of agreement form, the renter will first be presented with a type of liability waiver statement which is known as an assumption of risks and liabilities. By agreeing and signing the liability statement, the renter is accepting the penalties associated with the possible damages in the trailer that he rented as well as the fees that he will be paying for overdue rentals. Once signed, the renter will then have to submit the form to the personnel or the representative of the trailer rental service providers. The personnel will be incorporating further details about the rent in order to complete the form and to begin counting the renter’s rent duration. 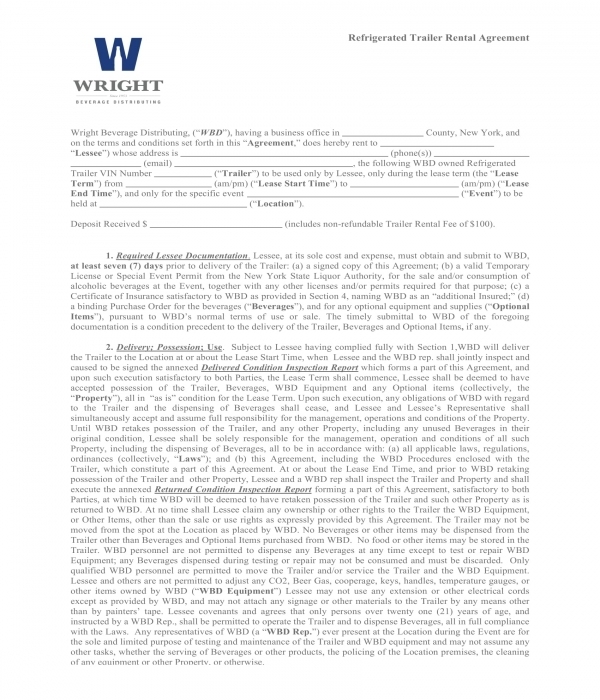 Refrigerated Trailer Rental Agreement Form – Distributing beverages to different places and locations demands a lot of attention be taken and considered by the distributors and beverage sellers since there are possible factors which can cause the beverage to spoil and spill when not transported properly. For this, a refrigerated trailer must be rented by the beverage sellers and distributors which can only be done with the aid of a structured refrigerated trailer rental agreement form. In the agreement, the renter will be able to know the amount of the deposit that he is required to supply, the delivery and use conditions of the trailer owner, the documentation to be supplied by the renter which will prove the legalities of his business, and even the obligations of the renter for ensuring that the trailer will not be damaged nor be at loss. Accompanying the agreement is an inspection report form which is important to be completed in order to determine the current condition of the trailer in comparison to its condition when it was returned by the renter after the period of the rent. The identification of the renter and the trailer owner – The names and the addresses of both parties should be stated in the form to have a documented statement and introduction of who will be classified with responsibilities and obligations within the rental period or duration. Rental payment information – The financial obligations of the renter, as well as the fees which are shouldered by the other involved parties of the agreement, are required to be calculated and finalized in the form. This assures that all parties know what their contributions are and when the dues for their payments will be. Pick up information – The date of when the renter will be using the trailer truck and the allowed geographical locations or areas wherein the trailer can be driven by the renter are indicated in the form to inform the renter about the limitations for the trailer’s travel distance and mileage. 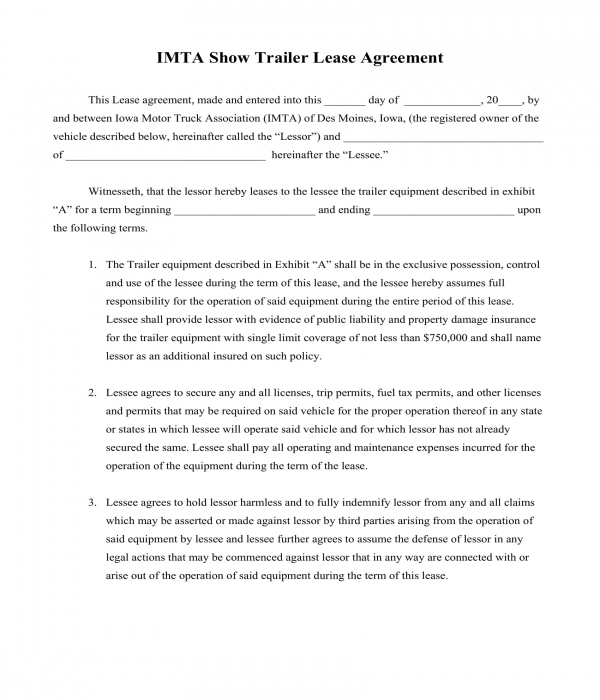 Why Use a Trailer Rental Agreement Form? Trailer rental agreement forms are not only documents which are basically to be signed and submitted by the renter and the trailer owner, but it is a significant document to ensure that both parties have communicated well-enough to execute a successful business agreement. Some trailer owners also prefer to have the notarization seal of an attorney which then makes a simply crafted agreement into a legal form.